"Taylor Mac's play Hir, now having its regional premiere at Stage West, is essential viewing." Support arts journalism! Read this review at Theater Jones! Taylor Mac's play Hir, now having its regional premiere at Stage West, is essential viewing. Fort Worth — It’s not a friendly show, Hir. It’s not warm and fuzzy—is any show that cites Sam Shepard’s Buried Child as inspiration likely to be cuddly? From the get-go, it pushes you away, challenges the audience to try and root for somebody, anybody onstage. You can’t even say its title without getting it wrong (it’s pronounced “here,” FYI). It badgers the audience with their own ignorance, then lampoons itself for its own excesses of virtue. Hir deliberately makes it hard to pick sides. Which is appropriate, really—the characters, while taking things to absurd, darkly comedic extremes, are trying desperately to communicate about bedrock questions: Who am I? What does “home” mean? What do families owe one another? Is there any place for the old, or must it give way completely to the new? No one’s completely right and no one’s completely wrong; there are no villains on the stage, but there are people who do monstrous things to one another. Fortunately, there’s just enough comedic sugar in critical darling Taylor Mac’s spiky, audacious black comedy to help the arsenic go down smoothly, and for its regional premiere Stage West has assembled a fantastic quartet of actors who bring it—in all its poisonous, glittery glory—to life. 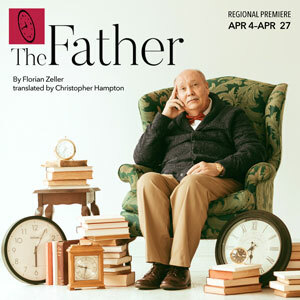 The play opens in a typical, lower-end suburban home: wood paneling, tchotchkes, mass-produced “art” from Bed, Bath & Beyond (kudos to the attention to detail from set designer Clare Floyd Devries)—that appears to have imploded. Clothes are strewn over the floor and the furniture, the kitchen table is pushed up against the front door, and knotted rags cover the windows. And slumped in his recliner is Arnie (Bob Hess), the ostensible paterfamilias, in a dress, clownish makeup, and a pink wig. Into this chaos comes Isaac (Blake McNamara), the family’s oldest son who enlisted and spent his three years in the military working for Mortuary Services picking up body parts of fallen soldiers, and who comes back to find his home irrevocably changed. Isaac’s father had a devastating stroke after losing his job, a fact that Isaac’s mother Paige (Cara Statham Serber) decided not to mention to him, and is essentially a drooling houseplant subject to Paige’s whims. Paige has become militantly woke and refuses to conform to any behavior that she tolerated as a housewife under Arnie’s tyrannical rule. And Isaac’s tomboyish younger sibling Maxine (Zander Pryor) is mid-gender transition and now goes by Max, demanding that the family acknowledge this new identity by using gender-fluid pronouns (“ze” rather than “he/she” and “hir” rather than “him/her”; “Max, get down here and explain your ambiguity to your brother!”, Paige hollers up the stair upon Isaac’s arrival). Isaac struggles to adjust to the new status quo, while the family struggles with the intrusion of Isaac into their happy new bubble, and as Isaac attempts to reassert control over his home and rehabilitate his father, family resentments come to a devastating head. Under the tight, talented direction of Stage West Associate Producer Garret Storms, Hir is the latest in a series of boundary-pushing productions from the veteran company this year; 39 seasons in, no one can accuse Stage West of resting on its laurels. Storms excels in balancing the play’s absurdist elements with emotionally grounded performances. The cast is uniformly excellent, with perhaps the most powerful performance coming from Serber. Happy and perky on the surface, but tightly wound beneath, she turns in a ferocious performance as Paige, gradually revealing the deep wells of animosity and resentment simmering under the surface of the character, and her fierce commitment to protecting her new reality at all costs. She has a lovely, lived-in chemistry with McNamara’s Isaac, and her growing frustration with his unwillingness to get with the family’s new program is beautifully realized as it descends towards the inevitable, final confrontation between the two. And while her behavior towards Hess’ Arnie, which ranges from a tolerant mother to a toddler to an owner disciplining an unruly pet, has moments of unsettling cruelty, Serber commits to each facet of her character unflinchingly, challenging the audience to turn on her. The final moments of the play crystallize its conflict. Paige, striving for a place on the vanguard of a new world, but mired in the resentments of the past and her hatred for her husband. Isaac, struggling and failing to hold on to a home that no longer exists, and maybe never did. It’s Max, the real avatar of the new, who can recognize the necessity of discarding the past while still showing compassion to its remnants. So amidst the bleakness of the play’s conclusion, there’s a moment, not quite of hope, but a sort of grace. Home might not be what you remember it to be—but maybe it’s in motion, in transition, into something more real. It’s not a comfortable night at the theater, but it may well be an essential one. Join us for a 15-20 min discussion of ideas and themes after selected performances. A member of the artistic or production staff, plus – on selected dates – a local expert, artist, or scholar is on hand to facilitate the exchange.